Stiff microbial films often coat medical devices, household items and infrastructure such as the inside of water supply pipes, and can lead to dangerous infections. Researchers have developed a system that harnesses the power of bubbles to propel tiny particles through the surfaces of these tough films and deliver an antiseptic deathblow to the microbes living inside. Biofilms are slimy colonies of microbes held together by internal scaffolds, clinging to anything they touch. About 80 percent of all medical infections originate from biofilms that invade the inner workings of hospital devices and implants inside patients. Eradication is difficult because traditional disinfectants and antibiotics cannot effectively penetrate a biofilm's tough surface, the researchers said. In the journal Applied Materials and Interfaces, a team led by researchers at the University of Illinois at Urbana-Champaign describes how they used diatoms—the tiny skeletons of algae—loaded with an oxygen-generating chemical to destroy microbes. "Most of us get those black or yellow spots in our showers at home," said co-author Hyunjoon Kong, a professor of chemical and biomolecular engineering and a Carle Illinois College of Medicine affiliate. "Those spots are biofilms and most of us know it takes a lot of energy to scrub them away. Imagine trying to do this inside the confined space of the tubing of a medical device or implant. It would be very difficult." "We could have fabricated a particle using 3-D printers, but luckily nature already provided us with a cheap and abundant option in diatoms," said co-author and postdoctoral researcher Yongbeom Seo. "The species of diatom we selected are hollow, highly porous and rod-shaped, providing a lot of surface area for the bubbles to form and a channel for the bubbles to escape." 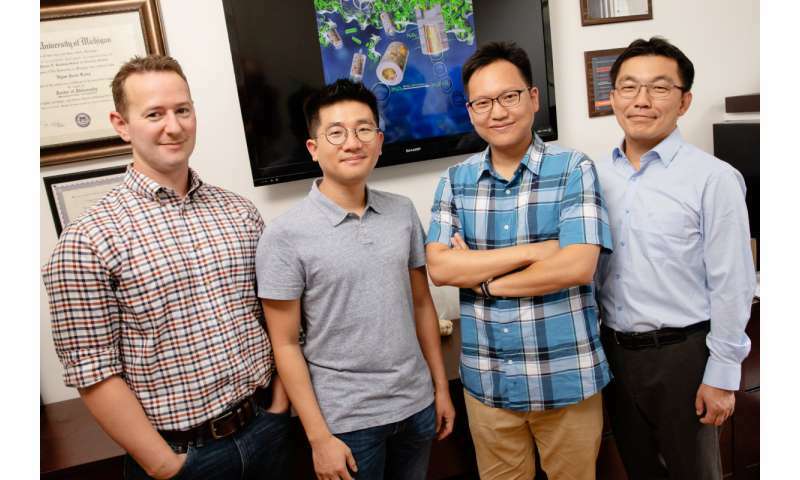 "We dope the particles with nanosheets of manganese oxide, then mix them with hydrogen peroxide and apply that to the surface of the biofilm," Kong said. "Once the diatoms break through to the internal structure of the biofilm, they continue to expel bubbles and facilitate the entry of hydrogen peroxide, which is an effective disinfectant against bacteria and fungus." "We have arrived at a mechanistic solution for this problem and the possibilities for this technology are endless," said co-author Simon Rogers, a professor of chemical and biomolecular engineering. "We are discussing our research with clinicians who have many exciting ideas of how to use this system that we did not even think of originally, such as the removal of dental plaque."